Every so often, the staff where I work get together separately and bake for the benefit of the staff where I work. One of our group is a vegan by choice, and another can't digest protein (for medical reasons). Like a good Jewish mother, I felt the need to make a cake that 1) both could eat and 2) so would everyone else. A parve cake wouldn't be enough. It would have to be egg-less as well. 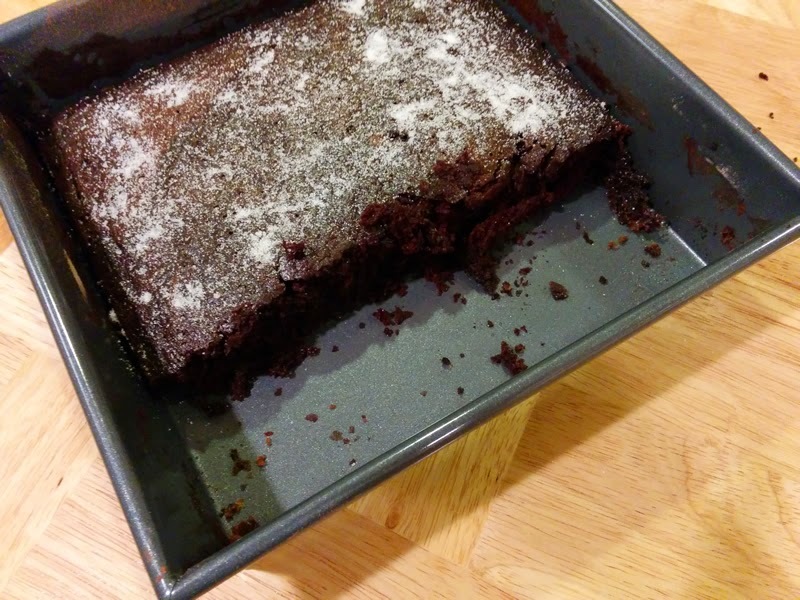 So I surfed the intertubes, and came across dairy-free egg-free chocolate cake recipes. I actually found several. They were all pretty similar, with slight variations of ingredients amounts, and all had very unglamorous names such as Wacky, Crazy or Depression Cake. But all the reviews raved about them. And the best part: stir and bake in the same pan! No mixer needed! Woo-hoo! Sign me up, George! This version is mostly based on the chocolate cake recipe by Michele Urvater. My final assignment for one of my library classes required me to create a web site. Of course, it was a recipe site. The site was yanked along with my account pretty much the day after I graduated, but I saved the recipes. During the next week or so I will post them here. The younger son of my neighbor across the street was my middle child's best friend, so my kid lived over there during most of his non-school waking hours. One day he came home for a rare meal here, and raved about his bff's mom's brisket recipe. She was nice enough to give me a copy of it. It's supposed to be her great-great grandmother's recipe, but the use of soy sauce and ground ginger makes me think that it didn't exactly come with her on the boat over from Eastern Europe. It's a pretty good recipe, even if when I make it, it doesn't taste like her's, according to middle child. The most likely reason is that she uses different brands. Who knows? Rhetorical question -- does anyone actually HAVE leftover chocolates? Growing up, one of my favorite things to get at the local candy store was an egg cream. No egg, no cream. Just 3 ingredients: milk, seltzer and chocolate syrup. But somehow I could never get the proportions just right. Hmmm ... needs more milk ... needs more syrup ... needs more seltzer ... repeat until you make a gallon. I asked darling son what he would like for me to make for Valentine's Day. As usual, he shrugged and said, whatever. I didn't even ask daHubby because he would just say make whatever I like, so the score is thus: 2 for whatever. Why then should I then wreck the kitchen for anything fancy? So brownies to the rescue! Rather than fall back on my standard brownie recipe, Hershey's triple chocolate brownie pie (which I clipped from a 1991 Hershey's ad and is not, unfortunately on the current Hershey's web site but you can find a copy using The Google), I thought I would try LunaCafe's Silky Fudgy Brownie recipe. The LunaCafe recipe is more complicated, and requires a stand mixer and a saucepot (unlike ol' faithful which only needs a bowl, whisk and microwave to melt the butter). However, LC calls for 4 egg whites instead of 2 whole eggs, so I thought I'd give it a go.